THE FIRST VENTRILOQUIST I saw giving a live performance was children's evangelist Mr. Joy Cummings and his little friend, WILLY. Working through Child Evangelism Fellowship, Mr. Cummings held a week-long children's crusade at our church. I begged my parents to invite Mr. Cummings and Willy to our house for dinner--and they did. And he said yes! At the end of the week, Mr. Cummings came to our modest little house. From the moment he entered our front door, I pestered him with questions. I even asked about Willy's clothes. I asked for details on how he made Willy's mouth move. Mr. Cummings generously and patiently answered the questions of an eager 8-year-old girl little girl. 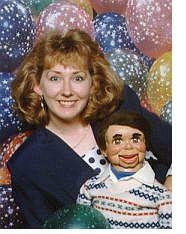 Sometime later my parents took me to see another ventriloquist, Marcy Tigner, with "Little Marcy." I was born too late to see Paul Winchell with "Jerry Mahoney" and Shari Lewis with "Lamb Chop" on television (until I was grown with children of my own and Shari hosted a children's show on PBS). But it's thanks to the public library (and now eBay!) that I've been able to watch these great ventriloquists and their hilarious sidekicks. And it's also thanks to the hard-working ventriloquists who toured churches and schools that I became fascinated with the art. As for seeing a famous ventriloquist, I enjoyed the Nestle Quik commercials featuring Jimmy Nelson, "Danny O'Day," and "Farfel" the dog. They sang the jingle: "N-E-S-T-L-E-S, Nestle's makes the verrry best..." and Farfel crooned, "CHooooooaaaaawww-clut!" with a snap of his jaw on the final note. It was too much to resist. I announced to my parents, "I want to be a ventriloquist!" My parents also gave me the Jimmy Nelson record album, "Ventriloquism for the Beginner." I started following the lessons right away, every day during Christmas break and then every weekend during school. I got through all the lessons on both sides, laughing at Danny's and Farfel's comments while Mr. Nelson offered direction on breathing and vocal exercises. Finally, I felt ready. I gave my first performance the following fall for my fifth grade class. I was nervous, but Ronnie was smooth as a salesman, and my classmates cracked up laughing! That's all it took. I was hooked. After graduating from high school, I entered my first competition, the Young Adult Division at the International Fellowship of Christian Magicians Convention, when I was 18 years old. It was my first trip away from home, my first airplane ride, and my first visit to the Midwest. Ronnie and I were so nervous! He was one of the very few smaller dummies--we wondered, how can we compete against these other teens with their expensive professional vent figures? But I steeled my determination to do my very best. Ronnie never forgot a line and we sailed through our presentation. Imagine our shock when the awards were announced and the panel of professional judges gave me and Ronnie FIRST PLACE. What a thrill! So I studied my craft with diligence and attended every workshop and conference I could, making the trek back to the international convention once a year. I started my own entertainment ministry in the greater Seattle area, first called "Kimn's Kaleidoscope" and later "Kaleidoscope Entertainment." Ronnie and I never had to advertise because we had so many word-of-mouth referrals. By day, I worked in an office and later a newspaper to support my habit, and by night I performed on weeknights and weekends with my buddy, "Ronnie Smith." We added magic and other characters to our act. And then, I met someone...no, not a magician or ventriloquist like I thought I might marry, but an engineer. (Yes, that's funny.) Ronnie eventually accepted my new husband and stage crew member, Russ--but only after he warned Russ to watch out or I'd put HIM in the suitcase! I wrote all our comedy routines and developed 10-, 20-, 30-, and 60-minute shows. When my sons were born, I recognized that writing, memorizing, rehearsing, and performing away from home was getting too difficult to do with young children in tow, so I refocused. I recognized that I could still write and care for my family, so that's what I did. Just as I immersed myself in learning the craft of ventriloquism, I've joined writers' groups and attended conferences and college classes to improve my writing, editing, and marketing skills. I'm a columnist and have earned over 24 writing awards, and my work appears in numerous book anthologies including the Chicken Soup series. Now he wants his own line of books, DVDs, and even a radio show. Sigh. With his determination, I just never know!